Is your ATM the real thing, or a 3D printed card skimmer? We know that 3D printers will eventually take over the manufacturing of just about everything, but we didn’t think that we see criminals find a use for them as early as 2011. Last week the blog Krebs On Security brought to light how an ATM skimmer gang used 3D printers to create the skimmers and steal over $400,000 from ATM machines. And we thought that the first criminal use of 3D printers would be to print perfect hundred dollar bills! First of all, what’s an ATM skimmer? It’s something we’ve learned that you had better be on the lookout for, that’s what! They are handcrafted, custom made overlays that can be popped on to an ATM, typically fitted over the card slot, so that when you swipe your card, it swipes your card’s details. 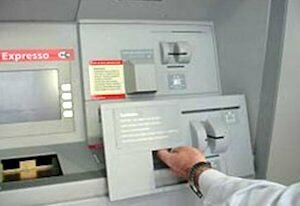 With your account number and PIN in the criminal’s hands, the next step is for them to withdraw money from your account with a quickly reproduced ATM card. The skimmers come in all shapes and sizes and with their own devious way of working. Krebs has a page on quite a few skimmers he’s seen and you can take a look at them here. Let’s get back to the 3D printing part of this story. As you can imagine, it must be a laborious process to handmake an ATM skimmer for each particular ATM machine, and then each subsequent copy. As we know, criminals don’t particularly like the idea of working, so one of them figured out that they could get a hold of a 3D printer to do most of the work for them. With some photos and measurements of the ATM machine’s interface, and a CAD/CAM three-dimensional modeling program, a revolution in ATM skimming was born. In fact, even if an aspiring gangster is short of the funds required to buy their very own 3D printer, they can attempt to do what any of us with a plan for a 3D object can do: upload the file to an online 3D printer service to print it for you. An ATM skimmer part ordered from online 3D printer i.materialize.com. The order was declined. We hope that all the online services’ employees are as alert as those at i.materialize.com was last summer when they received an order to print an ATM skimmer. We don’t know if the client labeled his order “ATM Skimmer” or not, but regardless, the engineers were quick to recognize what the final device resembled and declined the order. Now that word of this new criminal business model is out, look for the cost of ATM skimmer kits to plummet as the price of ATM skimmer CAD/CAM files go through the roof.